Andrea Huber was hoping to grow her family. The registered nurse was trying to get pregnant for a second time, but endometriosis was making it difficult, so she underwent a routine 20-minute minimally invasive procedure known as laparoscopic surgery. "I was trying to clear lesions from my abdominal cavity around my ovaries to reduce pain and to, hopefully, help me get pregnant," said Huber. Huber said she never felt quite right after the procedure. And a couple of weeks into her recovery, her abdominal pain became so bad she was rushed to the hospital. "I've never experienced anything like it and I had natural child birth," said Huber. Doctors discovered she had a life-threatening infection after her bowel had ruptured. "I was so sick that at times I didn't think I was going to make it," remembers Huber. Huber survived but only after several surgeries and weeks in the hospital. She was one of thousands of patients who've been injured by something called stray energy. "Stray electricity from the device that was used ended up damaging my bowel," she said. 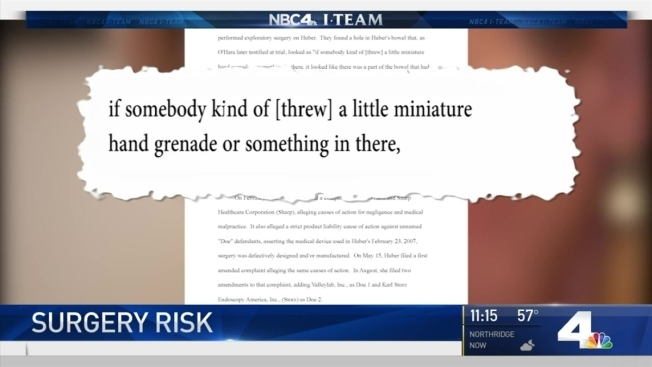 An NBC4 I-Team investigation has found that the medical devices used during many minimally invasive procedures can, in rare occasions, burn the internal organs and tissues of the patient. Procedures performed millions of times a year for everything from hernia repair to organ removal. "The surgeon doesn't know it, the patient doesn't know it and all of the sudden the patient gets very sick," explained Pascal Fuchshuber, MD, PhD, FACS, a board member of The Society of American Gastrointestinal and Endoscopic Surgeons (SAGES) and an expert on the use of surgical energy. During laparoscopic surgery, doctors insert long electrical instruments through small incisions into the body and perform surgery with the help of a tiny video camera. Usually, everything goes smoothly. But sometimes the energy escapes from the device, burning the person's healthy organs or tissues which can cause serious injury or even death. In Huber's case, a doctor described the damage to her abdomen as "if somebody kind of threw a little miniature hand grenade or something in there, it looked like there was a part of the bowel that had just basically blown open." That's according to a 2008 lawsuit that Huber filed and won against the maker of the device. "I feel very lucky that I'm alive because it easily could have gone the other way," Huber said, "I think I was very close to that happening." A 2016 study found thousands of stray burns from laparoscopic surgery occur each year -- in some cases leaving patients with lifelong injuries or worse. "If you get one of those injuries, there is a small but definite chance that you can die," said Dr. Fuchshuber, who was a co-author of the study. He said these types of injuries "have happened way more often than we think." Stray energy injuries can happen in several ways. A doctor could accidentally touch the wrong part of the body with the electrical device, electricity can jump from one surgical instrument to another, or the energy can stray from the tool to patient's body. "There can be energy that goes out of the insulation and hits and organ or tissue or blood vessel," said Dr. Fuchshuber. In fact, Fuchshuber's study found insulation defects in up to 39 percent of devices and even in some brand new instruments. He's concerned that many doctors don't know the dangers of these surgical instruments. "We asked some of the most prominent chiefs of surgery around the country to answer a couple of questions about these things and we saw that, at the most, they got half of the questions right," he said. Fuchshuber and SAGES have started a program called FUSE, Fundamental Use of Surgical Energy, to educate surgeons about the risks of electrical instruments in surgery and how to use them safely. He said surgeons "should adapt their technique and how they use these instruments to the fact that every one of them could have this defect." The Food and Drug Administration has also approved a technology called AEM which can eliminate the risk of stray energy burns according to Encision--the company that makes it. But so far, it's only being used in limited number of hospitals. We asked the FDA to discuss the problem of stray energy injuries with NBC4 but they declined an interview. Instead, in a statement, the agency told us they've received reports of stray energy injuries and they "routinely monitor and review reports we receive to determine if additional action may be necessary." "I don't think they're taking it seriously enough," said Huber, who continues to suffer with symptoms from her injuries. "I have a lot of pain when I eat. I never know when it's coming. The fear of waiting for problems to strike is exhausting. It takes away from my family life. It takes away from my kids. It's terrible." She wants the industry to do more to prevent the same type of injury from happening to even more people. "There's a morally right thing to do which is to make sure these devices are safe and the fact that there's a way to do that that's not being used just makes me sick," she said. The I-Team reached out to Medical Device Manufacturers Association for comment about stray energy injuries, but they didn't return NBC4's phone calls or email.